I absolutely adore the fact that my friend Mimi, from Annapolis, has occasion to take business trips on a regular basis to Syracuse. Because even though I drive through the Salt City all the time on my way back and forth to Watertown, without a reason to stop it’s just a blur along Route 81. And believe me, I drive like a bat out of Hell; it’s really blurry. Earlier this month, Meems was up here, staying in her fav, the Jefferson Clinton Hotel, and I drove up to meet her for dinner in Armory Square after a follow-up hearing appointment with my ENT. If you have a reason to spend a night in the ‘Cuse, like, I don’t know, a basketball game or something, consider the Jeff-Clint. It’s one of the grand dame kinds of hotels: older, but completely renovated, classic, elegant. And it’s located right in the heart of Armory Square, so there’s lots of good food about. I grabbed a quick coffee at Freedom of Espresso around the corner while I was waiting for Meems to read a text I sent to her home phone (LOL, I’m swift like that), and it was a lovely space. For dinner, we chose Bistro Elephant, which shares a menu and space with Lemon Grass. I don’t really understand the elephant theme, but the space is great: sleek and warm at the same time, with dark woods and comfortable banquets in the bar. The atmosphere is very chill, with relaxed, but not slow, service. If you’ve already clicked through to look at the menu, then you know what I ordered as an appetizer. DERR: steaky bacon! Roasted, then stewed, this pork belly was rendered down and luscious, with a hint of smoke flavor and a nice jus. It was served with chili tamarind sauce and little fried buns a la bao but with a bit more flavor and texture due to the frying technique. They had a light crispness outside, but were much more pillowy and fluffy inside than another other Asian steamed buns I’ve had. Thumbs up. The sauce was wonderful: garlicky, spicy and round; and little bacon-y pork sandwiches with the buns, meat, sauce and jus were addictive. I loved this dish. And Mimi, who is seriously one of the best people ever, period, let me eat most of it. 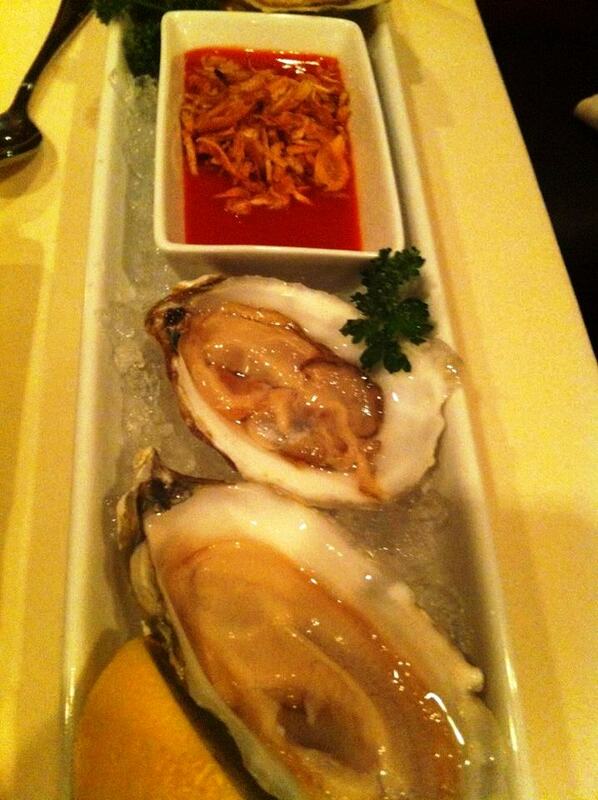 Have we discussed the oyster phase I’m going through right now? I don’t know what it is, impending spring, maybe? But I want them all the time. My sign is in the house of the Oyster or something. Even after last week’s seafood binge at Parc, I have no trouble finding fresh vocabulary to bring you news of our other fantastic appy, Maine oysters with sambal and fried shallots. It’s actually Meems with whom I first ate oysters, so maybe it’s becoming a tradition for us. If so, consider me a traditionalist, because these were slammin’: huge, creamy, briny bi-valves, with sweet/spicy red chile sauce and crispy shallots, which were so fried they were texturally similar to the French fried onions you get from a can and use to top your green bean casserole each year. Topping each monster oyster with a squeeze of lemon and some of the balanced sambal plus a smidge of crunchy shallot was a perfect combo, although they were good with the tamarind sauce from the pork buns, too. At this point in the meal, we were both really happy campers, and I’ll give you a spoiler: that feeling never subsided. I still have it, in fact. Sometimes I just walk down the hall at work and whisper to myself, “sambaaaaaal.” No wonder I haven’t gotten promoted yet. How fun is the word sambal? I gave it a rest until the entrees, but Meems couldn’t resist the tom yum soup, which is a comfort food for her. A Thai staple, tom yum is comprised of lemongrass, kefir lime leaves, fish sauce and crushed chiles. To my unaccustomed palate, the fish sauce was a bit jarring, but I liked the cilantro and lemongrass flavors in it – the broth was exceedingly aromatic. The straw mushrooms taking a swim in Lake Flavor also were a nice touch. Meems and I are both kind of suckers for scallops. Fact is, I eat them often when I’m out because they always seem so expensive to make at home. That is clearly faulty logic, as they’re no less pricey in a restaurant, but my brain can’t be logical all the time about food, people! I love it too much! I had the set menu version of the scallop entrée: pan-seared diver scallops with bacon vinaigrette. The large scallops were really perfectly cooked: browned and slightly crisp outside and almost meltingly tender and rare inside. The flavor, as usual with these most delicious of shellfish, was clean and almost creamy. 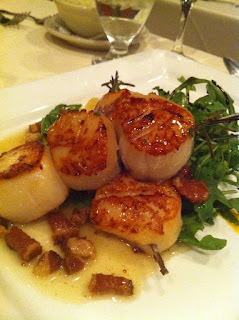 They were served over a bed of arugula with a piquant Berkshire bacon vinaigrette, bright with cider vinegar. There was a big bowl of white, fluffy rice served alongside both our meals, and I really liked the blandness of the rice with that sparkly dressing and the peppery arugula. This dish was firing on all eight cylinders: the luscious scallops and fatty bacon with the fresh, bitter arugula and sour vinegar created a really balanced presentation that was satisfying without being too heavy. Mimi’s scallop entrée was on special: the same huge diver scallops swimming in a moat of delicious Asian-inspired broth, with mushrooms and green onions. It was a hearty portion, but the lemongrass in the broth lightened up the affair, giving it depth but also freshness. This dish was both earthy and light, which after the feast we’d just inhaled, was a welcome addition. Look at all those mushrooms! I die. Because so much of our meal at Bistro Elephant was Asian-tinted, I’m going to go ahead and recommend its sister restaurant Lemon Grass as well. I can’t imagine this entire menu isn’t as successful as its Americanized relative next door. We gave BE a nine on the BHS scale, and I would definitely go back to try the pulled pork poutine, roast duck, or lobster and pheasant ragu over pappardelle pasta ribbons. You don’t need to be dressed up here, but the feeling is upscale, so proceed accordingly. And enjoy! This was a spectacular meal, and somewhat unexpected. I hope you enjoy it as much as we did. Join the Big Hungry Shelby Facebook page post haste! I slap extra pictures on there when I can, and the dialogue with Big Hungries the world over is great. On Twitter, I post everything from BBQ to beauty queens and aerospace news, so follow me @BigHungryShelby. Don’t forget, vintage BHS t-shirts are now on sale for $20, and Santa Fe Ole Food Company is giving 15% off to all my readers with the code bighungry2012 until April 16. My personality is big, my hunger is bigger! If you’re a faithful BHS reader – and I know you are! – you’ve pretty much noticed that my two favorite Big Hungries, besides my parents, are Jill and Melinda. These two gals, one a work friend and one I gained in a complicated but fortunate dating and friendship family tree branch-out, are some of the most fun peeps with which to break bread. We did so much of it last weekend, when Melinda and I drove down to South Jersey to hang with Jill, that I’m surprised the Greater Philadelphia area has any bread left. You may remember I wrote a dispatch from NJ last year around this time, when Jill lived in Lambertville, and we crossed the bridge for some fun times in New Hope, PA. This time, we began and ended our weekend with delicious, casual Jersey eats, using upscale Philly cuisine as the meat in the sandwich. On Friday night, after a wee bit of GPS-related shenanigans – Shawn and BLD changed the voice on my beloved GPS and now she sounds like a transvestite. I’m too lazy to change it back, and the whole thing is just annoying – we arrived at Jill’s and promptly freshened up so we could hit the local ‘burb shops in Marleton: Black House/White Market, Sur La Table, Blue Mercury, Ann Taylor, and Trader Joe’s. At TJ’s, which is soon opening stores in Rochester and Albany, if you want to visit, I procured a 70% cacao dark chocolate bar jammed with dark, rich caramel and dusted with coarse sea salt. It was fantastic, and I was able to share it with two of my co-workers, K and A, at our meeting in New Hampshire this week. They agreed it was delicious. I can’t wait to tell you about lunch on Saturday, but first, a mid-morning snack. We took the train into Philly for the day, walked around the fun Italian Market and South St. all morning, then hiked up to Rittenhouse Square. On the way, as hunger pangs started plaguing our trio, Cookie Confidential appeared like an oasis amid the city blocks. Melinda ventured inside and returned with three perfect chocolate chip cookies, awash with bacony goodness. That’s right, my friends, this dastardly bakery makes cookies with bacon fat instead of butter. They are crispy, and leave your lips glistening after you bite into them. And once I did, I swear to God I felt the last five years of age and stress lift off me like a shroud. Those years flitted away into the Philadelphia skyline as I swallowed my first bit of chocolate, sugar, and pork fat. I am not kidding, I think wrinkles actually smoothed out of my face – it was that good! So, you know, if you’re in Philly, you might want to go there. The baked goods may have magical healing properties. Like fountain Cokes from McDonald’s when you’re hung over. Finally, tired and tempest-tossed, we found Rittenhouse Square and the incomparable Parc Bistro. This Stephen Starr-run mecca of French everything has long stood as one of the goliaths of Philly food. I’ve been wanting to dine there for ages, and was thrilled when the real thing was as good as all the hype. First of all, the atmosphere is tres Parisienne: all subway-tiled, bread-stationed, and brass-railed. Second, we had two servers, a busboy, and a manager all lavishing attention on us that was helpful, cheerful but not intrusive. Even when I mistook whatever the manager was actually trying to ask us for him wanting to take away our menus, he was gracious. Dude, I’m hard of hearing, I have trouble in bustling spaces! Jill and I had worked out some must-order items ahead of time from the online menu: the petit plateau seafood tower and the chicken liver mousse. We also loaded our table with the wild mushroom tart, macaroni au gratin, pommes frites and onion soup. We shared everything, tapas-style, and still left groaning. While I enjoyed a kir royale, the others loved the romarin cocktail, which employed elderflower, rosemary and grapefruit. The petit plateau was a beast, in a good way. Shrimp, clams, oysters, mussels, tuna carpaccio, scallop ceviche, and squid salad were piled high on an elevated, silver tray with ice and lemon wedges. The abundance of it all is tied in with the appeal of the gorgeous seafood and savory preparations. To break it down, I actually didn’t care for the clams or shrimp, which were both a little fishy for me. Melinda and Jill did enjoy the jumbo shrimp, though, and attacked the mussels with gusto. My favorites were the scallop ceviche, which was clean and bright with subtle citrus and chile, and the oysters, which were creamy and huge. The vinegary mignonette sauce was perfect with a squeeze of lemon on those beautiful, briny, bi-valves. 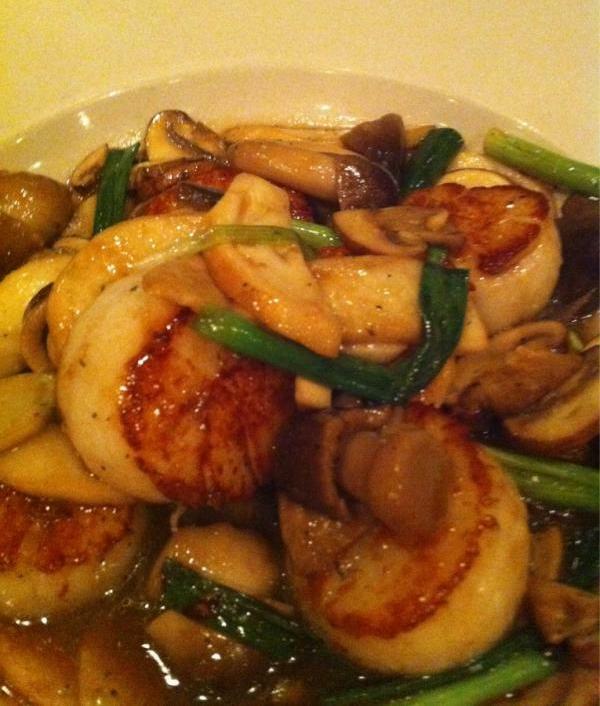 Melinda made sure to pronounce her affection for the scallops with the assertion that she’d like to take a bath in them. I'm not sure BLD would care much for that, but OK. The tuna carpaccio was very simple, showcasing the velvety tuna, which almost dissolved on the tongue, it was carved so thinly. The octopus was the final highlight – a salad of the tender seafood, savory, earthy, with garlic and herbs – fantastic. I’m not sure even this bounty of the sea, though, could compete with my absolute favorite dish of the meal: the chicken liver mousse, accompanied by grainy mustard, country bread, pickled shallots and port wine gelee. OMG, you guys. I schmeared some of the pate on the bread, topped it with the shallots and jelly, ate it, and then just melted into a pool of thoughtless pleasure in my seat for at least 20 seconds, unable to speak or write down coherent words. This bite of food was the perfect balance of salt, fat, sweetness, and that elusive umami savoriness that makes life worth living. We don’t need to have a chat about chicken liver pate, do we? I mean, you ate giblet gravy as a kid at Thanksgiving, right? You’ve had dirty rice in Cajun joints? If so, you’ve eaten liver and liked it, so stop freaking out. It’s not at all gamey, mineral-y, scary, foreign or gross. What it IS is salty, meaty, creamy, and flavorful. Basically, this is the kind of dish you should seriously considering dropping everything you’re doing right now for, hopping in the car, driving to Philadelphia, getting at table at Parc, and chowing down on. The port jelly was genius with the salty mousse – its sweet, winey lightness countered all of the rich unctuousness of the pate and worked with the tart, sour, pickled shallots in perfect harmony. Plus, with the crunchy bread, crisp shallots, luscious pate and dollops of delightful jelly, you had all your textures working as well. The mushroom tart, while being probably the weakest dish on our table, was still quite good. It was not what I was expecting, which was a thick duxelle or mixture of finely diced mushrooms cooked down with lots of butter and wine in a traditional tart shell, but was more like a shitake pizza with a puff pastry crust. The flavor was very deep, though, and it was good enough. The mac and cheese, masquerading on the menu as macaroni au gratin (aha, I sniffed you out! 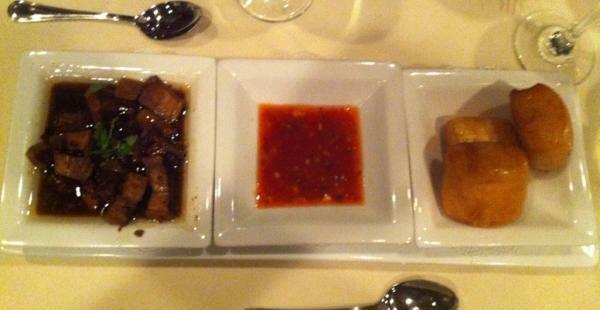 ), also sported a depth of flavor with which I was impressed. The gruyere cheese incorporated into the thick sauce was yum-city, and the pasta was perfectly firm – a solid and sturdy dish. The onion soup also was gratineed, or topped with cheese. Again, it was the terrific gruyere, which I always feel is almost winey in its flavor profile. The soup base was complex, hinting at apples, beef, chicken and roasted vegetables. I asked if there was calvados (apple brandy) in the broth, and was told no, but I don’t believe them. It was too complex not to count some kind of unique spirit in its mix. What is lurking beneath your gratin depths? Last but never least, pommes frites. There’s a reason we call ‘em French fries, folks. These fries were, simply, perfect. Hand-cut, double-fried and well-salted, these beauties were addictive. Just slightly crunchy on the outside and thin enough to be potato-y but not too starchy inside. A must-order. I would like fries with that! Look, there was nothing to give Parc but a 10 on the BHS scale. Even the fishy shrimp and clams didn’t subtract a millimeter from the pleasure I experienced here from tip to tail. I wanted to hang out much longer and eat much more, but my pants wouldn’t hear of it. Jerks! While we were at the table with our tower, we garnered lots of attention from other patrons, two even taking pictures of our table. Who knew the food you ordered could make you famous? I have to encourage you to visit Parc during your next Philly encounter. It’s busy there, but totally worth the wait. To cap off our Jersey weekend, we hit Ponzio’s Diner in Cherry Hill on Sunday morning. Another showstopper on the New Jersey diner trail, Ponzio’s makes its own spicy Italian breakfast sausage and slammin’ corned beef hash, and get this, they deep fry their French toast. Seriously, you guys. Get some. If you need a weekend escape during this glorious early spring we’re having, why not hop in the family truckster and hit up the Greater Philly area? You’ll eat well, that’s for sure. Plus, there’s plenty of junk to, like, learn and stuff. While we were strolling along in the area of South St, I saw a house where Napoleon Bonaparte’s brother used to shack up. Who knew? Are you a member of Big Hungry Shelby’s group on Facebook? Join us today! On Twitter, I post everything from BBQ to beauty queens and aerospace news, so follow me @BigHungryShelby. Don’t forget, vintage BHS t-shirts are now on sale for $20, and Santa Fe Ole Food Company is giving 15% off to all my readers with the code bighungry2012 until April 16. My personality is big, my hunger is bigger! Ah, September 2011…a time of epic floods, international travel, my 34th birthday, and a review I started but never finished. During a protracted bout of jet lag, which enveloped my birthday and was augmented by the flood-triggered melee at work, Big Hungries Melinda and Derek took me out to Amici for a very lovely dinner. I took pictures, made observations….then forgot to ever write it up. I’m usually hyper-organized, but last fall was a real doozy. Luckily, Amici, the new(ish) pizza pub right next to NYSEG Stadium in Downtown Binghamton, isn’t going anywhere, and so I bought a certificate off Restaurants.com to eat there, and took Melinda a couple weeks ago for round two. The rosy remembrance I had continued, and I can’t wait for round three. 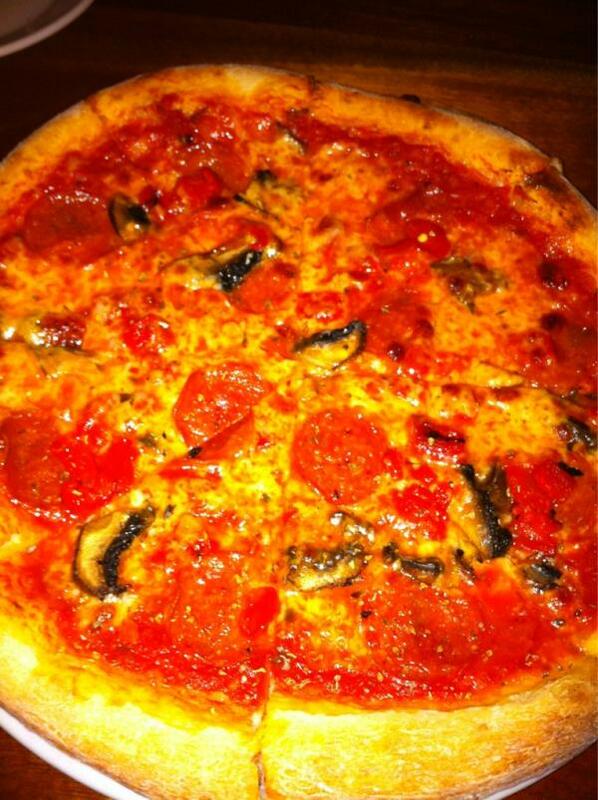 Translating to “friends,” in English, Amici Pub & Pizzeria is a bit of an undiscovered gem. Each time I’ve been, it’s been bustling but not crowded, and surprisingly full of an older set of clientele. I guess that’s surprising due to the bar-dominated space, ESPN-showing TVs and high volume on the music dial – the vibe is downtown chic though not posh, and not what I would associate with Boomers. That said, the food is good enough that if I were a Binghamton resident, I’d be frequenting the place, too. It even looks kind of enemic, doesn’t it? The starters are fine, but they don’t really sing. You can tell the focus here is on the pizza. 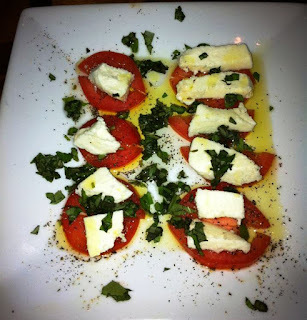 That said, we sampled the fried zucchini and caprese on our first visit, and the bruschetta this time. 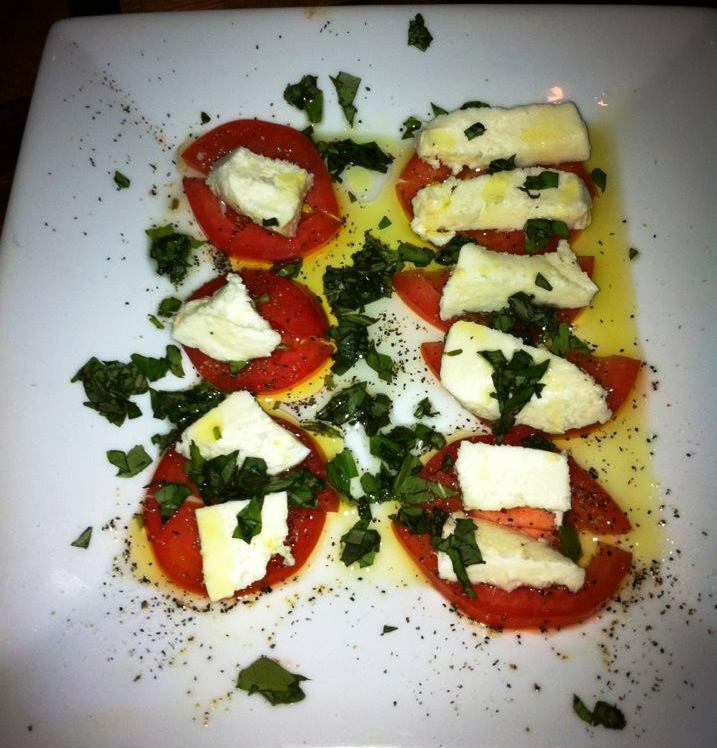 The caprese salad, in particular, was oddly disappointing. I mean, it’s hard to really mess up tomatoes and mozzarella, and this tasted fine, but the slices of plum tomato were peculiarly teensy, and I think chef felt like the mozz ought to match aesthetically. You see the puny picture below: Odd. Similarly, the bread for the bruschetta had cheese on it, but just a funny little dollop in the middle. Were I steering this bread boat, I would have shredded or torn up the fresh mozzarella and placed it evenly over the bread before broiling it. It was crispy on the outside and soft on the inside, and sufficiently garlicky, but the raw tomato sauce lacked oomph. For my money, Tony’s in Endicott is killing everyone else in the area right now for bruschetta. Don’t bother with it at Amici. It’s filler, and you don’t need filler, because excellent pie is about to hit your belly. 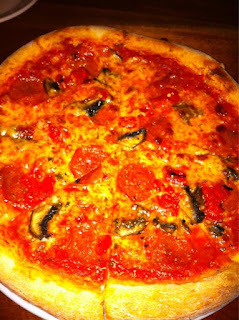 We tried two pizzas last fall: rustica and tutta guarnita, and two this time: Verona and S-P-O. Not one of them disappointed in any way. I almost don’t know where to begin in describing them to you. Each sports a thin crust, with a pleasing, not too crisp, crunch to it. You get a good chew from a well-developed, substantial amount of yeast in the dough, and it’s not too thick or dry. It really is a good platform for the high quality toppings being pressed into service. But the rustica was a real beaut: pancetta and roasted red peppers with fresh mozzarella. 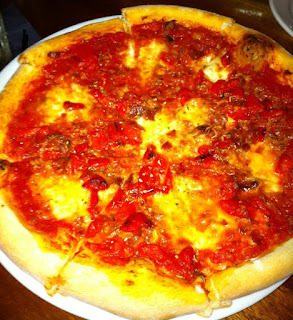 The pancetta lent richness and saltiness, while the red peppers were earthy and a little bit concentrated from the pie’s time in the pizza oven. Both toppings were pretty finely diced, so you tasted all of the components in harmony, with crust, sauce, cheese, bacon and peppers dancing in a savory waltz of splendor. Melinda and I were pretty evenly split on our second visit on whether the S-P-O or Verona was our favorite. I’m a sucker for fresh arugula wilting over a hot pie, and while I usually prefer red pizza to white, the Verona’s mix of prosciutto and fresh garlic was elevated by the shower of fresh, peppery, green leaves crowning it. The S-P-O sports thin-sliced, slightly spicy sausage plus red peppers and onions to break up the richness. It was delightfully salty and comforting. A solid, hearty pie. I’ve not yet tried any of the pasta dishes, which are pretty straightforward, nor the sandwiches at Amici. Frankly, I’m stuck on the pizza and would really like to plow through every item on that section of the menu before I mess with the pastas. The pizzas are just more interesting to me; much more inventive flavor combinations than the rather traditional pasta offerings. We did sample dessert both times, and neither bowled me over. In September, the chocolate cake was just too rich for me to eat more than three bites of…after a full meal, it was too much. We had the crème brulee this time around, and while it was OK, the texture wasn’t nearly as silken as I like it, and the extra layer of loose sugar floating below the custard was a little strange as far as mouth-feel was concerned. Now that I gaze at it, the raspberry sauce on top looks like blood splatter. Someone call CSI! On the strength of the fantastic pie and casual, modern atmosphere, I’m giving Amici an eight on the BHS scale. Improved appetizers and desserts could easily bump this place to a nine, but I will warn you that we had some shenanigans with settling up our bill at the end – first we were charged for two desserts, then it turned out that our Restaurants.com coupon had a cash-only fine print edict that was a little obtuse to the casual user…and I didn’t have enough cash. We got it all settled, but Melinda also knew someone else who had trouble with a certificate there, so I think it might be better to just forgo the deals and pay cash for my pizza in the future. That’s OK, it’s good enough to justify, although a hassle-free check-paying process would be nice. The point is, despite the mediocre starters and desserts, and the slight bill aggravations; I still want to eat there, like, tomorrow. That’s a pretty telling attitude, isn’t it? Amici is warm, relaxed and inviting. They use cured pork products heavily. Sold. Plus, plentiful drinks + great pizza + sports on the TVS = any American’s dream spot, right? It’s essentially a sports bar that non-sporty folks will love. You’re missing out if you’re not a member of Big Hungry Shelby on Facebook. Join us today! On Twitter, I post everything from BBQ to beauty queens and BAE Systems news, so follow me @BigHungryShelby. Don’t forget, vintage BHS t-shirts are now on sale for $20, and Santa Fe Ole Food Company is giving 15% off to all my readers with the code bighungry2012 until April 16. My personality is big, my hunger is bigger! PS: Do you like the new logo? I hope so! Thanks to my buddy and graphic designer extraordinaire (you know who you are) for the pork-tastic look!